The world energy consumption is constantly rising. According to the US Energy Information Administration, the increase is well over 28% between 2015 and 2040. It is important to note that in commercial buildings, this number is even higher at nearly 40%. Add to this the pressure exerted by government agencies about depleting energy supplies and global climate change. To meet this demand everyone who uses energy – residential or commercial building and industries have to prioritize reduction in energy consumption. It is not surprising that energy efficiency is the goal of every commercial building, both in the US as well as internationally. Reducing energy costs and increasing energy efficiency is not only useful for improving building operations but also to address concerns about environmental impact of energy consumption and ensure sustainable building environment. The value of energy efficiency goes well beyond the benefits of reduced energy costs. Other benefits include improved air quality, reduced pollution and increased energy access for everyone. Hence building owners, facility managers and building control engineers must adapt strategies, performance metrics and technology to attain the value of energy efficiency and strive to become a green building. In this article we will take a look at various energy-saving approaches along with their advantages and disadvantages. In particular we will be looking at 1. The traditional approach of Measurement and Verification (M&V) and compare it with the more modern 2. Ongoing Commissioning process. service providers, equipment manufacturers, financial service providers and utilities. M&V is also the standard process for any energy-related government incentive programs or utility rebate programs. This is the most common approach for the energy-industry to understand that the policies, procedures around energy implementation in a building are providing the necessary results. It is used to 1. Verify savings, 2. Report against targets and metrics in the building control systems and 3.test which energy conservation techniques work and which do not. M&V (measurement and verification) are performed on-site and take into account various engineering methods and calculations. 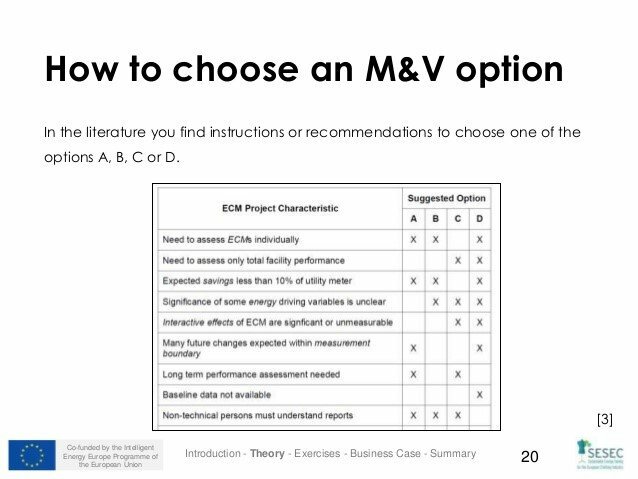 The basic premise of M&V is to setup baselines before any energy efficiency process and measure consumption and demand after the implementation. This will determine the best path to reduce the energy consumption in a building. 1. Goals and KPIs (Key performance indicators) such as expected energy, cost and carbon emission savings. A. Partial Retrofit Isolation: Energy consumption is both measured and estimated. B. Retrofit Isolation: Usage is measured. C. Entire building: Energy usage of the whole building is measured. D. Calibrated Simulation: Computer modeling and building performance simulation is used to predict energy consumption. The below table from SESEC is a guide to help you determine which option to pick. 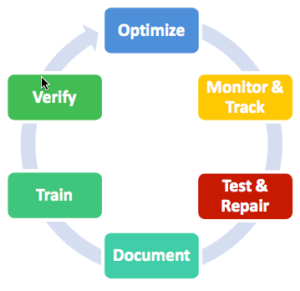 There are several benefits when Measurement and Verification (M&V) is done correctly. 1. Recommendations for facility operations and maintenance: A good M&V helps facility managers discover operating problems. 2. Enhance financing of energy efficiency projects: A good M&V provides reports on the results of efficiency investments. 3. Demonstrate compliance with energy reduction policy and regulations: Use of M&V increases the reliability of emissions-reduction report. These reports might qualify for government incentive programs. While the use of M&V is very popular and provides substantial benefits to building performance and sustainability, if done correctly, there are some disadvantages that are inherent to a dated process. 2. Passive evaluation process: The output of this lengthy and complicated process are reports that would at best suggest which building facilities need to be maintained or tuned for increase efficiency. At best they can provide building performance simulation for design and operation. What it fails to achieve is an active alert of which systems need to be replaced immediately and what is the ongoing wear and tear of systems. 3. Slower energy efficiency process: Obtaining baseline and measuring current readings, creating simulations as well as analyzing everyday costs is a time-consuming activity. While the M&V activity is ongoing there are multiple systems in the building that need to be adjusted and maintained or replaced and these have to wait for the process to be completed. This is not the best method to obtain information fast enough to take action. Ongoing or Continuous Commissioning (OCx) is one of the popular types of Commissioning. This type of commissioning (CX) involves ongoing monitoring and automated processes that collect data. The data is collected from Building Automation Systems (BAS) and Building Energy Management Systems (BAMS). The data is fed through dedicated meters and sensors. The data that is obtained is analyzed and reported so that performance issues can be immediately fixed. How is Ongoing Commissioning performed? The growth and development of buildings and its consumption of natural resources has direct impact on our communities and environment. This also affects the socio-economic growth and sustainability. Hence green building projects have become very important. Green building is the practice of increasing the energy efficiency in buildings thereby reducing impacts on human health and the environment. The adoption of green practices has led to the advent of latest technologies, enabling automation in managing buildings as well as integration of all the energy consuming systems. These are called Building Automation Systems (BAS). They help in enabling data collection, automating controllers and ensuring that software is integrated. But the most important aspect of the building automation system components is ensuring that the goals of the system are met and it is maintained constantly while ensuring breakdowns and down-time are minimal. Ongoing Commissioning is the most important process that helps buildings achieve this goal. 4. Continuous improvement – Take ongoing corrective action for operational excellence in building maintenance management. 1. Achieve substantial energy savings by continuous improvement of equipment. 2. Predictive maintenance reduces energy consumption as opposed to reactive or time based maintenance. 3. Time taken to fix a problem is drastically reduced due to it’s standardized format that is accessible to every member of the energy maintenance team. 4. When combined with advanced analytic tools, it can easily facilitate a smart building solution. 1. Technology implementation, which is accompanied by organization culture, change management and training. 2. Initial investment in time, money and effort to implement tools and technology. It is seen that this is usually that is offset by long-term benefits. In conclusion, energy efficiency is the number one priority of every property owner. The goal of reducing operating costs of energy, reduced energy consumption; increased energy savings as well as increase environmental sustainability is at the forefront of all buildings. This can be achieved through various means. While Measurement and Verification is the age old tried and tested process to quantify and measure your building energy efficiency programs, newer methods are proven to be more effective in long-term economic performance of a building’s operating system and equipment. Ongoing Commissioning (OCx) is becoming the industry best practice in maintaining the intricate and complex systems found in today’s buildings. OCx is the process that helps building management systems are optimized for peak performance and avoid hidden energy consumption.